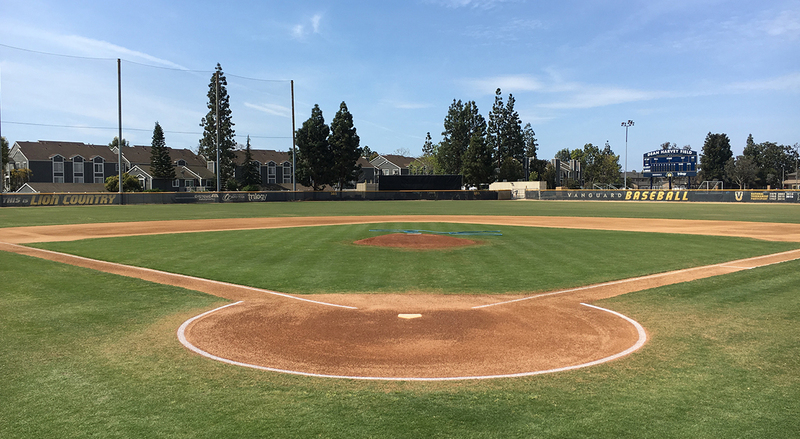 May 24-27 Under Armour Memorial Day Classic at the Great Park Sports Complex in Irvine. A 3-game guarantee against top competition. Baseball Factory scouts score all the games. June 14-15 Under Armour Father’s Day Classic also features top competition, live game scoring, and free player profiles for incoming freshmen. 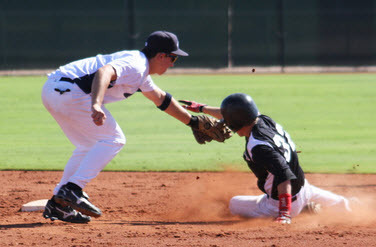 Also a 3-game guarantee and played at the Great Park Sports Complex in Irvine. 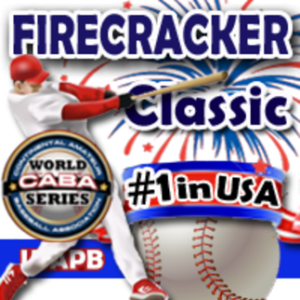 July 6-12 USA Premier Firecracker Classic, the biggest tournament of the summer, features the top teams in the western region playing at the Great Park and top Orange County high school and college fields. A 4-game guarantee for this one. 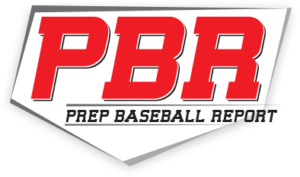 July 12-16 Under Armour Southwest Championships, one of the top tournaments for local college recruiters and scouts. 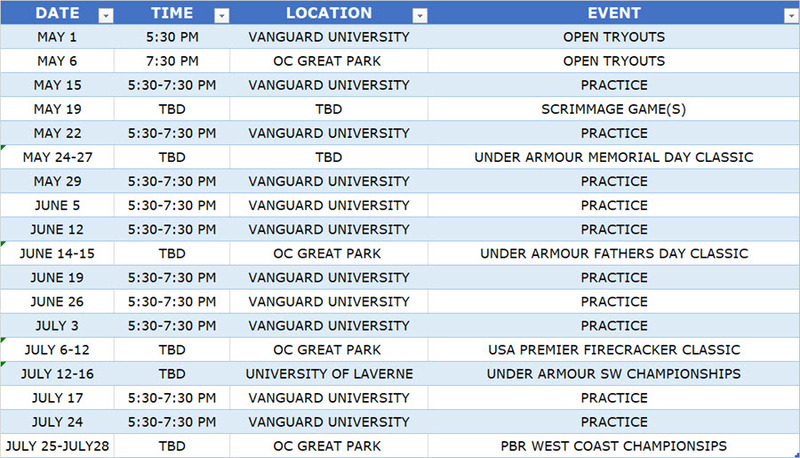 Games are at the University of LaVerne and surrounding schools with top teams entered. 4-games guaranteed. July 25-28 Prep Baseball Report West Coast Summer Championships caps off the season with a top tournament at the Great Park. Another 4-game guarantee and a chance to get noticed by PFR scouts and writers. Cost is $895 per player and includes all tournaments, practice sessions and scrimmage games starting mid-May. “Pitcher Only” fee is $295. All fees must be paid before player can practice or play in games. A payment plan for player fees is available with $325 due May 15, June 1 & July 1. All fees must be paid before player can practice or play with the team. 5:30 Wednesday May 1 @ Vanguard University, where team practices will be held throughout the summer. Vanguard University is centrally located at 55 Fair Drive, Costa Mesa, across from the Orange County Fairgrounds near the 55 and 405 interchange. 7:30 PM Monday May 6 @ The Orange County Great Park Sports Complex on Baseball Field 5. OC Great Park is located at 8000 Great Park Blvd, Irvine. Players must register online HERE in order to tryout, practice, or play with any Blue Wave team or participate in any Blue Wave Athletics event. There is no cost to register.